It has, but it is almost forty years ago and just as it was on Saturday, it all came about because of someone making a superb gesture. 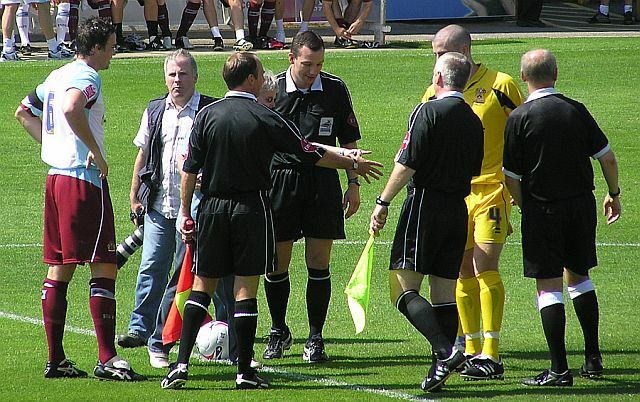 With Michael Duff returning to Whaddon Road for the first time since his transfer to Burnley, and with his brother wearing the captains arm band for the opposition, it was club captain Frank Sinclair who suggested to manager Steve Cotterill that Michael could be captain. Our Duff, Belfast born, is a Northern Ireland international, and forty years ago two Irish international colleagues and brothers came up against each other when Burnley met Stoke City in the League Cup. In goal for the Potteries side was Bobby Irvine and at centre forward for the Clarets was his brother Willie who was in sensational goalscoring form at the time. The idea of them both captaining their respective sides came from Clarets' manager Harry Potts who contacted Stoke manager Tony Waddington to put the idea to him. Waddington agreed to Harry's idea. It was all set up and the brothers Irvine met in the centre circle to shake hands and toss the coin, they were set to play against each other for the first time since schooldays. The greeting was friendly with both wishing each other a poor game. Neither of them can recall whether they called correctly or not but both can remember a miss from Willie in the replay that followed the 0-0 draw at the Victoria Ground. It was probably one of his worst misses. Willie told Clarets Mad, “It came from a cross from Willie Morgan on the right wing. I followed the ball in, as I always did. I was left with my left hand on the far post and my left foot on the line with the ball coming towards me. I managed to put it over the bar and then fell to my knees. Willie did and in that 2-1 replay win at the Turf he scored the winning goal. “There is a certain person still reminds me of that miss but my reply is always the same, 2-1,” he added. This article was originally published on 19th July 2005, three days after our pre-season friendly at Cheltenham when Michael & Shane Duff captained the two teams.